Pacifica offers you a unique and natural setting for your wedding. 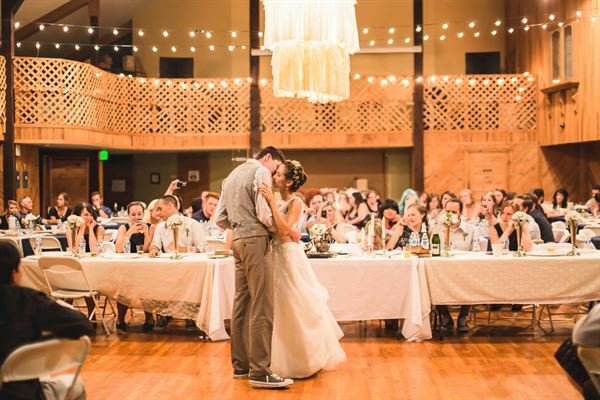 With 500 acres of conserved land in the beautiful Williams/Applegate Valley, we offer you the use of both outdoor and indoor facilities for your ceremony and reception (a nice combination and a wonderful back-up in case of rain)! Pacifica is an education-based nonprofit; your event fees help to support Pacifica’s community programs. The Madrone Grove, Pacifica’s outdoor site, overlooks a large pond and meadow. The distant view is a beautiful silhouette of Grayback Mountain. The Madrone Grove has three grassed tiers for chairs looking down to where a venerable oak shelters the wedding party. The indoor site, our large and welcoming Great Hall, can hold 200 or more people. The cedar walls and hardwood floors combine with a spectacular floor-to-ceiling, 16-foot-wide, glass roll-up door that opens to let the outdoors in. During colder weather, it allows occupants to still feel that the outdoors is right at their fingertips. There are separate changing rooms for bride and groom and a small prep kitchen (two refrigerators, sink, etc.) available in this building. Another option is the lovely 4,000 sq. ft. Pond House. This wood-paneled house is now listed on the state historic register. From 1860s homestead, to home of musician Steve Miller (“Fly Like an Eagle”) in the 1970s, to nonprofit Pacifica in 1999, this amazing property has seen a lot of history. The Pond House has a wall of windows and a 60-foot deck that both overlook the pond and mountains. It is a delightful place for a wedding party to stay, wedding showers, rehearsal dinners, and family gatherings. The Pond House can comfortably accommodate 18 guests or more overnight. After the ceremony, guests will adjourn to the spacious, cedar-lined Great Hall for the reception. A spectacular rolling glass door opens onto vaulted ceilings and 2,000 square feet of hardwood floor space. The building is wheelchair accessible and can comfortably welcome 200 to 300 guests. Ceremonies may also be held inside the Great Hall year round. This wood-paneled, 4,000 sq ft home with its 8ft stone fireplace, wall of windows and 100ft deck that overlooks the pond and mountains is amazing--furnished in nostalgic 1970's style reminiscent of the time when rock musician Steve Miller lived here.